It's 1525, and 20,000 native warriors are about to make history out of your little troop of Spanish conquistadores scouting the bay. There's only one way out. All eyes turn to Father Octavio, who needs no encouragement to call for divine intervention. BANDERAS BAY, Mexico -- It's 1525, and 20,000 native warriors are about to make history out of your little troop of Spanish conquistadores scouting the bay. There's only one way out. All eyes turn to Father Octavio, who needs no encouragement to call for divine intervention. It works! Just in the nick of time, one of the royal flags held aloft by your men starts glowing with a brilliant image of the Holy Cross. Terrified at the sight, the attackers flee. The day is saved. A popular legend has it that's how western Mexico's 50-mile-long Banderas Bay got its name. In Spanish, banderas means flags. Fast-forward to today, and the crescent-shaped bay is one the country's most popular vacation destinations, home to Puerto Vallarta, Nuevo Vallarta and part of the Riviera Nayarit on beaches peppered by close to 200 hotel-resorts. Hotel-resorts line the sands of Banderas Bay. Photo by Bob Schulman. 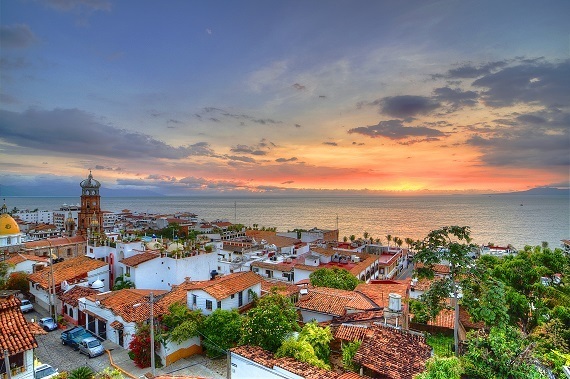 The bulk of the properties are in Puerto Vallarta (or simply Vallarta, as the locals call their town), as is an international airport serving all three areas. Developments spread north to Nuevo Vallarta and up the coast to what's now the Riviera Nayarit during periodic building booms in the late 70s and in the 80s and 90s, sparked in large part by liberalized air service treaties between the U.S. and Mexico. Another boom seems likely on the horizon when the latest treaty, signed last November, goes into effect on Jan. 1, 2016. Among key features of the new agreement, restrictions on the number of airlines that can fly between U.S. and Mexican city-pairs will be tossed out. Currently, under an earlier pact signed in 2005, only three airlines from each country can serve any given route between 14 Mexican points (mostly beach destinations including Vallarta) and cities north of the border. Routes between the U.S. and other Mexican points are now capped at two carriers per side. Downtown Vallarta offers a taste of old-world Mexico. Photo courtesy of the Puerto Vallarta Tourism Board. Easier access to Mexico means more seats zipping across the border and more competition between airlines, typically leading to lower fares, prompting more passengers to buy tickets. Built in 1992, the 511-room beachfront property in Vallarta's main hotel zone was "getting a little under the weather," as Villa del Palmar officials put it. The overhaul, which required a shutdown of the hotel for two months during the off-season last fall, brought a new design to the property's rooms inspired by Mexican pop culture. Outside, the project included new landscaping, waterfall additions, pool improvements and a widened entrance to the hotel among other upgrades. 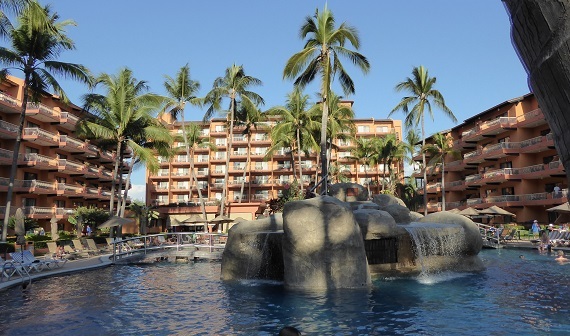 Villa del Palmar Puerto Vallarta after its recent renovation. Photo by Bob Schulman. Topping off the renovation, some 400 hotel employees carried out thousands of beds, chairs, tables and other room furnishings and carried in their new replacements. Two newer Villa Group properties are among 26 tropical palaces on the beaches running north along the Nuevo Vallarta, Flamingos and Riviera Nayarit side of Banderas Bay. A tip to future vacationers: Leave some room in your closet for a bunch of new tee-shirts proclaiming your love for places like Bucerias, La Cruz de Huanacaxtle, Costa Banderas, Punta Mita and other tiny dots on today's maps of the upper bay. Why? Because developers are standing on line to build new resorts there.